Would you append some sort of genre or origin onto each band name (the way Wikipedia tends to deal with these types of issues)? Is that helpful to your casual users that are just looking for more tracks by a new artist they’ve discovered (or an older artist they’ve just recently re-discovered), or would that make things even more difficult to figure out? Just because I know I like the band doesn’t necessarily mean I know enough about them to make that distinction. Would you try to differentiate between them by the record label by which the albums were distributed? That wouldn’t make much sense (for one reason, again, I don’t necessarily know enough about the band to make that distinction), as many artists will work with multiple labels throughout their career (and some will even re-release albums on their current labels that were originally released on other labels). As I mentioned above, iTunes appears to have attempted to tackle this issue by appending the country of origin to the end of the artist’s name. However, this still left 3 different artists on a single page, so it didn’t do much to help. 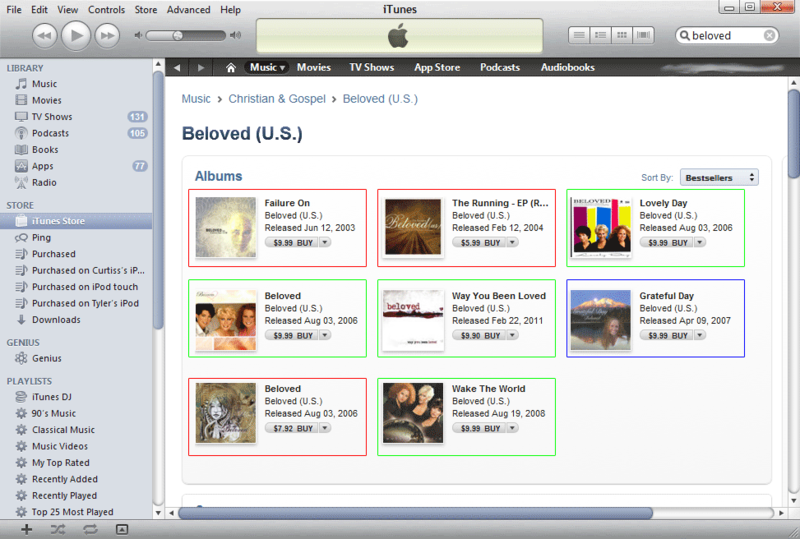 iTunes also shows one album and one single under the artist name “Beloved.” (possibly the UK group by that name – though the single is distributed by a label based in Boise, Idaho, so I somehow doubt it), but I haven’t been able to determine for sure whether the single and the album are by the same artist. I think the best possible solution would probably be to break up the artist page into multiple sections, keeping all of the different artists on a single page, but grouping albums according to each artist. 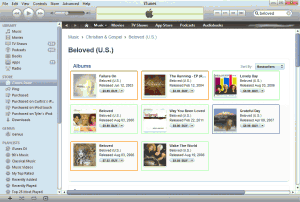 That way, when I search for something like “Beloved”, I would see that there are multiple artists by that name, and I’d be able to find the album I know and should be able to fairly easily determine which other albums listed on the page are by that artist. The potential problems I see with this solution are fewer than the other solutions, but they do still exist. Once again, if you don’t know enough about the group (let’s say you’ve only heard one song by the artist, so you don’t necessarily know the name of any of their albums), it still makes things a bit difficult. Further, even if I know the name of one or two albums by this artist, there’s no guarantee that those albums will be present in the music service’s database. With Zune, this is slightly less possible, as the Zune database allows users to view albums that aren’t available through the service, in addition to the ones that are (though, with multiple releases/versions of albums, this can pose a usability problem, as well). However, in iTunes, where only albums that are available for download/sale are listed, this could be much more likely. This solution also carries with it a probable need to perform more work manually within the database. Finally, no matter which solution you might be able to work out, you would still have to deal with the likelihood that users wouldn’t have their own music tagged in any manner that would make any of the solutions easier to implement. If I choose to run a “Genius” or “SmartDJ” playlist seeded by one of these artists that I have in my own collection, how would these services reliably pull related artists? Beloved happens to be the most recent example of this problem, but it’s far from the only example. Two other artists I’ve searched recently outlined the same basic issue. For instance, try performing a search for “DJ Hazard” on iTunes. If you’re looking for a little comedy to brighten your day, you might be in for a real shock when you download “All the Way -EP” or “PlayazDigital Vol 2”; while you’d be in for a true disappointment if you downloaded “Man of Hazardium” (the only “album” listed by DJ Hazard in the Zune Marketplace) and were hoping for some drum & bass to get your body moving. You could then run a search for “Grits” on the Zune Marketplace; and once again may be a bit disappointed. While iTunes and Zune Marketplace show mostly results from the Nashville-based Christian hip-hop group G.R.I.T.S. (or GRITS) in their storefronts, iTunes also includes one album by a different artist and Zune Marketplace shows albums by at least two other artists (on iTunes, there is a differentiation between a group called “The Grits” and the groups going by “Grits”). What are your thoughts on this issue? Is this such a rare occurrence that music services should just ignore it altogether (as they seem to be doing currently)? Is there an ideal solution out there? If so, what is it? Is there a good balance to be obtained between usability and accuracy? I’m very curious to hear your thoughts on this matter.